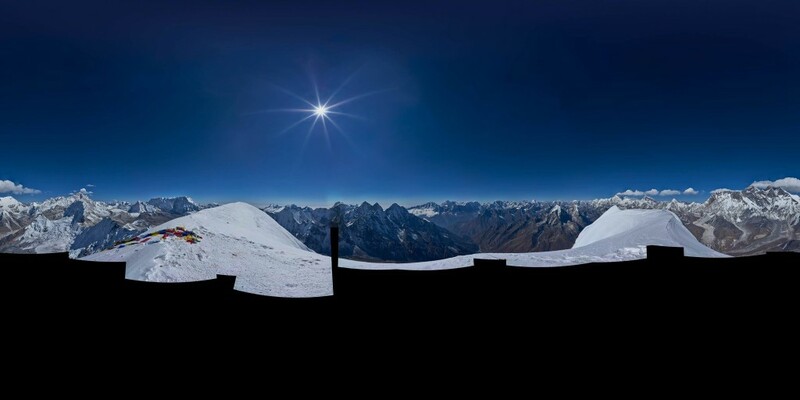 In conjunction with Thomas Worbs of Mountain Panoramas we have been developing some very exciting, interactive, 360° panoramas from various sites around The Everest region. These are very high definition and when viewed on a laptop you can scroll around, turn on labels and zoom in. Alternatively they are interactive when viewed on a smartphone. Just click on any of the photos below and a new browser will open. Enjoy the show and prepare to be impressed. Let’s start with the highest! This panorama was taken from a small knoll overlooking the South Col. Having been to the S Col a number of times I always wondered what the view was like from the small mound that was, quite literally, just over there. So what better way to end out than to walk … just over there. It’s 8,029m but doesn’t qualify as an 8,000m peak in its own right because there isn’t sufficient drop between it and Lhotse or Everest. I’m not even entirely sure whether it has ever been climbed so I might have made a first ascent! Anyway the view was absolutely fabulous and was well worth the 2 hour round trip. Makalu (5th highest) on the left with Lhotse (4th highest) in the centre and across to The Khumbu on the right. This next panorama is perhaps the one that we are most please with. Not the highest (that label goes to The S Col panos … see above and below) but without a doubt the best in terms of seeing the most amazing Himalayan vista. As with all the panoramas it’s really cool on a smartphone … but if you have the time and inclination fire up your laptop and have a look in high resolution with all the surrounding peaks labelled. Honestly … it’ll be worth it. This obviously got me in to a bit of a panic and I ended up missing a crucial overlap (see the photo). Thankfully I backed up the whole project with some summit video and Thomas was then able to reconstruct the crucial missing bits. Click the photo to see the finished result. Ama Dablam 360º x 180º summit panorama. It may not look much here but click … and enjoy! This is the site of Camp 3 on Ama Dablam. I was heading for the summit but the cloud was coming in and I realised that I could either summit, and not get the view, or I could drop back down to the site of Camp 3 and get a fantastic vista. It was a tricky one to take and a tricky one to stitch – but what a result. You can see climbers heading for the summit, the amazing layers in ‘The Dablam’ and a panorama that is pretty breathtaking. Enjoy. The site of Camp 3 on Ama Dablam. The South Col on Everest … our second highest panorama to date. I had been at The South Col only a few days before but the weather had changed and we decided not to try for the summit. We dropped all the way back down to Everest Base Camp, had a day off and then set off back up the mountain and arrived back here 4 days later! That’s quite some round trip. The weather was great and the clarity and colours were amazing so I set off away from the busy camp area to get in to a good position for the shoot. It was a little tricky because of the ever changing light conditions with the clouds scudding by but the result is amazing. Again, Thomas worked his magic because a lot of the ground shots needed recalibrating because of the varying temperature due to the clouds but you wouldn’t know it. And can you see the bird? That’s right – there’s a bird flying by. The S Col on Everest. Everest Base Camp after some fresh snowfall and before everyone had got out of bed. Indeed, as I was setting up, the sun started rising over the shoulder and I had to work quickly to make sure that all the photos were taken under fairly similar light conditions. This was slightly complicated by the fact that it was also quite cold and I can’t operate a lot of the buttons on the camera with big gloves. The whole shoot took around 25 minutes and Thomas did a great job – apparently the shadows had all changed by the time I had done the first rotation of 45 shots. In all there are at least 315 to create a 180° x 360° panorama and you can scroll from the sky to the floor and all the way around. Everest Base Camp. Early morning with sun on the way and snow on the ground. Brilliant. Everest and Nuptse from the famous viewpoint of Kala Pattar – as you have never seen it before. I had reached the main summit of Kala Pattar (slightly higher and up to the left – there are lot of prayer flags there) and tried to set up there but the view just wasn’t as rich. Partly this was because of the prayer flags and partly the angles just weren’t quite as good. So I dropped down to the original Kala Pattar view point (this is where everyone used to stop until about a decade ago) and thankfully, because it has fallen out of favour as being a lower viewpoint, I had the place to myself. This is a full 180° x 360° panorama and you can scroll from the sky to the floor and all the way around. The spectacular close up vista of Everest from Kala Pattar. A 109° x 360° from The Kongma La. Like the Everest Base Camp panorama an early was required and I was blessed with clear skies, a big moon and some atmospheric clouds on Lhotse. This is my favourite camp site in The Khumbu and I have never had to share it with any other groups. A lot of folk do the pass as a day hike from Chukkung to Lobuche (best) or in the other direction which is a bit of a slog. We use this amazing camping area for a couple of nights as part of our acclimatisation schedule so that when we arrive at Everest Base Camp we have already slept higher & have also taken in an ascent of Pokalde – just over 5,800m. The Kongma La. Best camp site in The Khumbu. A 110° x 360° The Renjo La – the most impressive Everest panorama in the area. Another panorama where I had to work quickly … but this time not because of the changing light but the fact that there were porters and trekkers arriving imminently. I don’t have an issue with having people in the photos but in this instance the area was going to get very cramped very quickly and when folk start wandering around you lose all control of the shoot. Perhaps the best panoramic vista in the Everest region. This is the view from the Renjo La. The mountain vista from Gokyo Ri above the village of Gokyo. This is an amazing, but accessible, panoramic viewpoint and is a short hike above the village. As we made the trip there were quite changeable conditions and it was difficult to know whether the light would be right, the cloud cover would be acceptable or indeed if the mountains would actually be in view. But on arrival we were blessed with a really great vista and the results speak for themselves. This is the summit of Island Peak as you have never seen it before. We were a small team (myself, 3 clients and 2 Climbing Sherpas) and there were only 2 others on the mountain that day. To get the summit shots without having any climbers in I pushed ahead on the summit slopes. I was rewarded with perfect conditions (albeit a little bit breezy on the summit) and enough time to take the 450 photos that make up this vista. Next up it’s Ama Dablam. Sadly in the 2014 season there was a lot of objective danger from the right side of The Dablam (a Climbing Sherpa died from another team and his 3 clients were injured when a huge block of ice fell on them whist they were on their summit bid). I was obviously hoping to get a panorama from the summit but it wasn’t to be. But that didn’t stop me spotting a great opportunity whilst travelling between Base Camp and Advance Base Camp. This was a shot from 5,000m on a ridge in amongst an amazing mountain vista and needless to say I am very happy with this on – the results speak for themselves. Click and enjoy. A panorama from the ridge above Ama Dablam Base Camp. What’s there not to like about Gokyo. Funnily enough for all the visits I have had to this wonderful village it was the first time that I took a jaunt around the lake. It is HIGHLY recommended and afforded some of the best views for not too much effort. The spectacular location of Gokyo nestled alongside the 3rd lake. Lukla airstrip doesn’t need an introduction really. Thame is a few hours West of Namche and has an amazing monastery set in to the hillside above the village. It is definitely worth a visit and has a Shangri La feel to it. It may be remote but that just adds to the appeal. Some of the best puja blessings I have had have been here and it just has the feeling of being a very auspicious place to be. Thame monastery – a very auspicious place to be. Talking of auspicious places here is Tashi’s prayer room. I saw it being painted in 1999 – it took 8 monks and nuns 42 days to complete and I saw it at the beginning, middle and end. Since then I have made a point of visiting every time I am in The Khumbu and every group that has been shown the room by Tashi has been in awe of what it is and what it represents. I’ve even slept in here a few times. Tashis prayer room – which has since been destroyed when her house burnt down in 2017. A very sad loss. A panorama with a difference. This is Phurba’s kitchen in Marylung where I stay when trekking in for Everest. He’s an eight time Everest summiteer but you would ever know it and he and his family are always most welcoming. His wife didn’t quite get the concept of what I was trying to do but she eventually sat still enough for long enough. Each panorama is not only painstakingly stitched by Thomas but they are painstakingly taken by myself. To that end we have decided on what is the best kit and equipment for the job. The camera is a Sony a7R which is very easy to use, very light and very high definition. The drawback is that it doesn’t like the cold so I carry plenty (and I mean plenty) of spare batteries and endeavour to keep the camera and batteries warm (enough). For Everest this presents possibly our biggest challenge but we are looking at different strategies to cope with the ever changing conditions. The make and model of tripod is a thorny issue – generally speaking the more stable they are the heavier they are and weight is definitely the enemy. The most recent acquisition which I have been using is the Amarula from Bushman Panoramics which gives a great height for not too much weight. For the panoramic head we didn’t need to look any further than the Gobi – again from Bushman Panoramics. It is a really nicely engineered piece of equipment and does the job to perfection. You can use it with big gloves on and still have the dexterity required to alter the necessary settings. Nicely crafted and a good chunky feel to it – this is a piece of kit that will never let me down. Next on the list is portable power. I have been using the GoalZero Yeti 150 which is charged using the Boulder 15 Solar panel. This is a piece of kit that is really really good … when the sun is out. Thankfully the sun shines a lot in Nepal so it is certainly not short of potential. It is a tad on the heavy side so I won’t be taking it up and down the hill with me but as a Base Camp power supply it is fantastic. The USB and 3 pin outputs are ideal for most situations and there is a ‘cigarette lighter’ output as well. All in all it copes with Base Camp life extremely well and I can keep all (and I have loads) of batteries, phones, laptops etc charged at all times. Now all you need to do is get in touch about Everest, Ama Dablam, Island Peak or trekking in The Khumbu and experience it for yourself.